The black peppering on discus fish is normal. usually discus fish that have a pigeon blood gene in them are prone to black peppering spots. Black peppering spots are a natural way for discus to adapt and camouflage themselves into their environment. If your aquarium has a dark colored background with dark colored gravel your discus fish will adapt to the colors. Any discus with a pigeon blood gene will start to develop back peppering spots. Any discus fish that does not have a pigeon blood gene will just darken in color. How do you treat or get rid of the black peppering spots? In order to reduce the amount of black peppering on discus fish you need to change the colors inside your aquarium. With discus the best color gravel or sand should be bright white. Stay away from dark gravel and dark backgrounds. Usually white gravel with light blue background is the best colors to make your fish look really bright and reduces the black peppering. Will the black peppering eventually go away as the discus get older? It all depends on the colors of your aquarium. If you have dark colors in the aquarium the peppering will only increase with time. If you have bright colors in the aquarium eventually the peppering will fade away. Depending on the environment that the fish were raised will determine if the black peppering on discus fish will eventually fade away or not. In my personal experience I have never seen the black peppering disappear completely but I have seen it fade drastically. 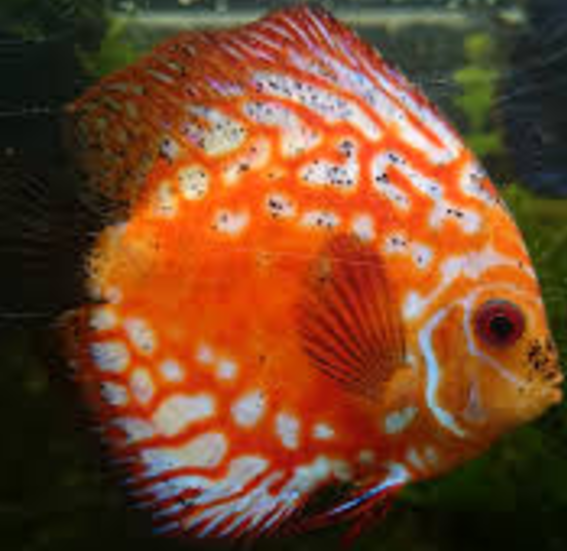 Also feeding your discus a high quality food will help to reduce the black peppering. Feel free to post your comments and contact me with any questions. I am always available to help. ← Caring for discus fish while on vacation.